Found 4 file extension associations related to URL Manager Pro and 1 file format developed specifically for use with URL Manager Pro. URL Manager Pro allows you to manage your bookmarks independent from a web browser, yet use your bookmarks with any web browser, like Safari, Firefox, Chrome etc. You can create and save several separate bookmark documents and you can access them all from the systemwide bookmarks menu. Using a systemwide bookmarks menu, you have access to your bookmarks in any app or web browser. You can also bookmark the current web page directly to URL Manager Pro from within your favorite web browser. In the URL Manager Pro documents, you can manage your bookmarks easily with drag and drop. You can add notes and colors to your bookmarks. You can also view your bookmarks in any font and size you want. 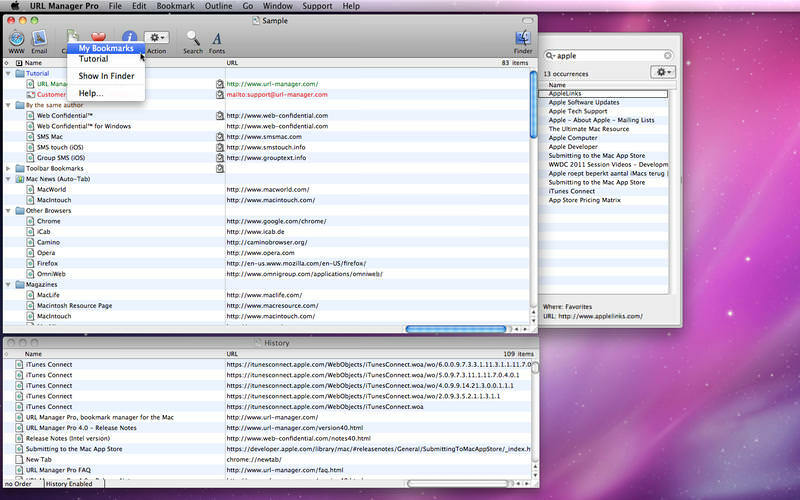 URL Manager Pro indexes its documents using Spotlight technology. This means that you can use Spotlight to find any bookmark, URL or term that you saved in URL Manager Pro documents. You can import bookmarks from all popular browsers, like Safari, Firefox, Camino etc. You can harvest URLs from text files and various other sources, like web pages, as well. You can also export your bookmarks to other formats like HTML, XML and XBEL. If you need more information please contact the developers of URL Manager Pro (Alco Blom), or check out their product website.